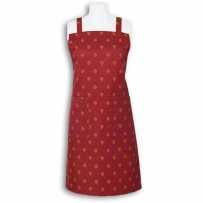 Although this kitchen aprons is offered in unique size, it fits all sizes. It covers the legs almost to the knees. The encroachment of the bodice part is wide, to cover well the top and to avoid staining. The straps placed at the waist are very long and can be knotted in front. The top of the apron attaches behind the neck with a sliding buckle that adjusts the length according to the stature. It is therefore a well studied article and very comfortable in order to cook serenely with a Provencal elegance. 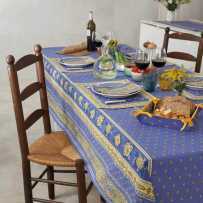 It is one of the products made by the Marat d'Avignon® textile factory, specialized in Provencal table linen since 1948. This company makes a point of honor to make live these typical patterns. They were inherited from the history of the merchants of Provence become manufacturers. On a background of color, the Bastide print is covered with calissons in contrast color, just as polka dots, but with a specific design for each collection. The decorations are made of paisley patterns repeated in linear and mixed with floral friezes in the color of calissons. As for chef aprons, the pockets are cut in the Bastide striped (or linear) print to bring a touch of fancy very chic. This is a large collection that we offer in our catalog. Starting with the kitchen accessories that usually go with the apron: insulated gloves and pot holders. In addition to kitchen items, the Bastide line comes in many cotton table linens, with possible anti-stain coating for tablecloths, and quilted for placemats and table mats of many shapes. Take a look at the Bastide products : you will be conquered for sure by this very nice collection.